The earthquake struck on Monday afternoon, some 110 kilometres north of Fort St. John, and was felt in Charlie Lake, Fort St. John and Wonowon. The earthquake's epicentre was just three kilometres from Progress Energy's fracking site, which the company immediately shut down, even though their activities have not been linked to the quake. After shutting down, Progress Energy notified the commission of the quake, as it is required to do under B.C. regulations. Those rules also say fracking must halt if an operation triggers an earthquake greater than magnitude 4.0, and cannot resume until a mitigation plan is put in place. The company has since resumed operations, telling CBC News it has complied with all the regulations. The quake was also felt by local residents, including Berniece Lilly, who felt it from her home on the Halfway River First Nation and is concerned the quake is connected with fracking operations. Earthquakes Canada seismologist Alison Bird called it a "significant earthquake." "A lot of people described it as a heavy truck coming down the road," she said. "Other reports, they felt a bit of a jolt. They thought an engine working outside their building had malfunctioned. Someone in Montney felt it in a home on pilings, which amplifies seismic shaking." Officials first thought the quake measured magnitude 4.4, but Bird said the latest data analysis proves it was a 4.6 magnitude earthquake — a very large quake for this region. "The past 10 years, there have been about 450 earthquakes in the region, they've been very small generally, magnitude 1 to 2," she said. B.C. 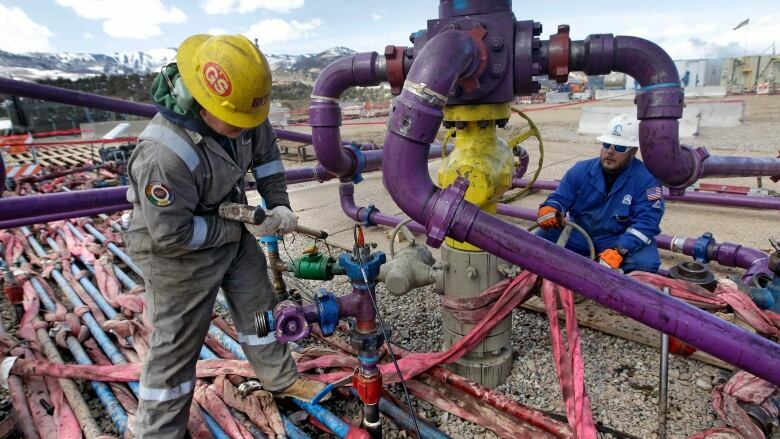 's energy regulator says many of those small quakes were triggered by hydraulic fracturing or "fracking," as companies inject water, sand and chemicals at high pressure deep underground to break rock and free gas. The phenomenon is called "induced seismicity." Studies have linked fracking with earthquakes in the U.K., Oklahoma, and in B.C., but it is not clear what role — if any — fracking played in the 4.6 magnitude quake this week. A northern newspaper reported that B.C. Oil and Gas Commission spokesman Alan Clay said the quake was "likely induced by hydraulic fracturing." But Clay emailed CBC News to say the commission has yet to determine a cause and is still collecting detailed seismological data. In the same email he stated, "B.C. has a leading role in North America in the detection and mitigation of induced seismicity associated with unconventional gas development." "If this is proven to be linked to hydraulic fracturing, this would be a world record in terms of size," said Kao. His research shows at least two factors must be in place to cause a quake through fracking — an area where tectonic plates are under pressure and the injection of large volumes of fracking fluid. In theory, he said, a bigger injection of fracking fluid can certainly trigger a bigger quake. "Certainly the injection itself is one of the necessary factors. If you don't have injection, chances are you may not have all these induced events," said Kao. Kao says B.C. 's regulators need to carefully balance the economic benefits of fracking with the possibility of the seismic danger to the public from larger earthquakes. Progress Energy is owned by Petronas of Malaysia, which also owns Pacific NorthWest LNG, the firm planning to build a giant LNG export facility near Prince Rupert, supplied by gas fracked in northeastern B.C. Magnitude 4.4 earthquake detected near Fort St. John, B.C.